The LASFS Theatre Party last Saturday was a disappointment in a couple of respects. Firstly, less than half of the people who'd had us reserve tickets for them showed up. (But Al Lewis and Tom Gilbert were there, giving us six for a nice, cozy party.) Secondly, the performance was not as good as it should've been. Up until now, the Savoy-Artes have been improving steadily, but this production of "The Yeomen of the Guard" was inferior to their whole last season. The costumes were beautiful, but the set was sleazy. Joe Kaye put in his best performance yet as Wilfred Shadbolt, but all the other actors missed fire. Phoebe could act, but couldn't project her voice enough to be heard over the music when she sang. Elsie could sing, but played the role in a much too coyly simpering manner. Col. Fairfax failed to play his role seriously (an occupational disease with Gilbert & Sullivan performers); a pity, because otherwise he had more than enough talent. Even the usually superb Richard Sheldon, as Jack Point, lacked his usual energy; he was competent enough, but gave the impression that he was glad this was the last performance of the show. I'm glad I went, but I hope the company is back up to last season's standards, at least, before their next production in a few months. If you'll check the Program to "Yeomen" elsewhere in this dist'n, you'll see that memberships in the Savoy-Artes are available. Don Fitch and I discussed this, and, if the LASFS doesn't object, we'd like to take out a $25 Patron's membership in the club's name, next season. The two of us would get the season pass for two, though. Since we figure that we'd both go to all three of the next season's performances, at a cost of $9 each, this leaves only $3.50 each we'd have to make up in extra expense -- which is tax deductable, anyway. Would the LASFS like the advertising value, or the prestige, of being a Patron of the Savoy-Artes for its next season? My cartographic talents, such as they are, have provided a map to the LASFS picnic at the State & Country Arboretum, to use its more-or-less official title, this Saturday. It's the dark blot at the corner of Colorado Blvd. and Baldwin Ave., in Arcadia. Most people will be driving out from Los Angeles on the San Bernardino Fwy., probably. The most direct route to the Arboretum would be to get off at Baldwin Ave., going left, and just continue until you get to the Arboretum. 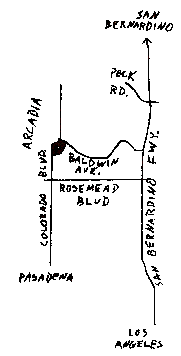 A faster way, using bigger streets, would be to get off at Rosemead Blvd., going left, and drive up to Colorado Blvd. ; then turn right and continue until you come to the Arboretum. If you come that way, then turn right again onto Baldwin Ave., until you come to the Main Gate. That's where we all meet at 10 a.m. -- the Main Gate. Wear comfortable clothes (walking shoes, if you've got 'em), and bring cameras and lunch according to your tastes. In fact, if anyone wants to bring a double lunch (two sandwiches, etc. ; one to eat yourself & one to trade for whatever someone else brought), I'm sure it'll be used. Cover -- I get the impression that we're getting hard up for covers. I'd like to put in a plea to the artists who're still active in Apa L for some artwork so that we'll have a small reserve to draw on. We're practically reduced these days to getting Jim Schumacher to draw something for us in a hurry on Meeting nights. As one of the OCs, I'd like to be more sure of being able to provide covers than having to pester someone at the club to draw something for us real fast, on a half-hour's notice. Dave Hulan -- I agree with you on travel expenses. My NyCon trip wiped out the cash reserve I'd been building up in my checking account slowly, over a year's time, and I even had to dip into my savings account for a bit. I just replaced the money in my savings account with my last paycheck, which left me with less than $10 in my checking account at the end of last month. Now I'm going to start building up my checking account again, and it'll take me until about next Summer before I could consider being able to afford another cross-country trip. Fortunately, the WorldCon's in Berkeley this year; and the '69 Con will hopefully be in St. Louis, which won't be too expensive to get to, especially if I drive. But I'm going to have to save for a couple of years if I want to go to Europe in '70, to the Con in Heidelberg and to see a bit of Europe. If I spend money going much of anyplace else before then, Europe will probably be out for me. I'd love to be in a position to be able to consider making a little trip to Chicago or Washington or Florida as easily as I can consider driving up to the Bay Area or down to San Diego for the weekend. ## On no country that touches on a Communist power ever kicking out the Communists once they'd taken over, this is true. However, if you define Communism as Russian imperialism (which it's not, of course), then there are a few Communist countries that've restored their own national freedom. Yugoslavia is the main example, and I suppose Albania has to a large extent -- that is, I don't think that Communism is being maintained in Albania by force of either Russian or Chinese troops, right now. Red China certainly has national freedom; it's nobody's satellite. If anti-Communist uprisings broke out in any of these countries, as they did in Hungary in 1956,I don't know what Russia would do. Communist takeovers in those countries just meant excuses for local dictatorships to establish themselves; and local dictatorships aren't limited to Communist countries. Fred Hollander -- I agree with you on the LASFS' "need" for Apa L. I think that the disappearance of Apa L would wreak a major change in the club's interests and social orientation, but the club has gone through major changes in the past. Apa L is good in that it makes communication easier for all the members -- which, for those neos interested in publishing, means quicker recognition. It used to be a tradition that neos in the club would sit quietly in the back of the room for about a year, unnoticed by about half the membership, until they felt acquainted enough to take part in conversations and activities. Now a neo can begin publishing within a couple of weeks of reading his first Apa L, and we take him into our inner circle almost immediately. As an example of non-Apa L communication, or lack of it, Ken Rudolph and I have been meaning for the last three weeks to talk over the publishing of the 3rd Best from Apa L, but we keep getting into conversations with other people on Thursdays, and by the time one of us looks up, the other's gone home. Without Apa L, I'd probably barely know who Ken is, and have almost no idea of his political and social views, or what he does for a living, or anything. But since meeting him in Apa L, and talking with him there, I feel that he's a personal friend of mine, not just someone I say "hello" to once a week. Apa L is very valuable for this reason. Len Bailes -- And still the rain came down, until the inevitable catastrophe occurred! Phil Lebow -- Do you think the writing practice you get in hacking out an Apa L zine every week helps you in writing school papers and essay exams?